An inflatable, portable lunar shelter that can be easily moved and set up. If you were doing some work far from a permanent settlement on the Moon, you would need a portable shelter that could be set up quickly next to your work site. ...it was now no particular hardship to live in a home that would fold up into a small trunk. Lawrence stooped slightly to enter the air lock. In some of the old models, he remembered, you practically had to go down on hands and knees. He waited for the "pressure equalized" signal, then stepped into the hemispherical main chamber. It was like being inside a balloon; indeed, that was exactly where he was. ...it had been divided into several compartments by movable screens... Overhead, three meters above the floor, were the lights and the air-conditioning grille, suspended from the ceiling by elastic webbing. Against the curved wall stood collapsible metal racks, only partly erected. The sides of the box fell flat, revealing a tightly packed, convoluted mass of silvery fabric. It stirred and struggled like some living creature. The igloo [inflated] in only three minutes. As the air generator pumped an atmosphere into the flaccid envelope, it expanded and stiffened in sudden jerks, followed by slow periods of consolidation... When it had reached the limits of its extension, it started to go upward again and the air lock popped away from the main dome. 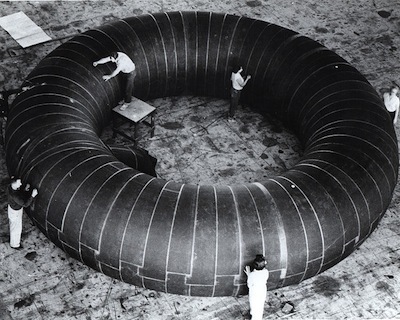 Apparently, there was a Goodyear proposal to build an inflatable space station in 1961; the prototypes never made it into space. In his 1939 short story Misfit, Robert Heinlein wrote about roofing a valley on an asteroid with synthetic spider silk, and inflating it with a breathable atmosphere. See also an earlier version of this idea, the airtight tent from Raymond Z. Gallun's 1951 novella Asteroid of Fear.